"How will the recently published Clinical Practice Guidelines (CPG) for Ocular Management affect my next visit to my eye care professional?" The recently published SSF Clinical Practice Guidelines for Ocular Management of Sjögren’s were developed to provide evidence-based recommendations for physicians and eye-care providers to advise a logical sequence of treatment options for dry eye. One aspect of the recommendations was to describe methods of grading the severity of dry eye disease and basing therapy on severity and the patient’s response to previous therapy. The guidelines also put into perspective some of the recently developed techniques for diagnosing dry eye and monitoring therapy. Many of the measures described in the report have been used by practitioners in previous therapy of dry eye, but some of the newer options may not yet have been incorporated into all eye care practices and the described system of grading severity may be new to some practices. Therefore, the effect of the published guidelines may have different implications to different patients. Your physician or eye care provider may discuss some of the newer options for diagnosis and grading of severity in particular cases. This will probably be true for the testing of tear osmolarity and testing for presence of the inflammation marker MMP-9, as those new tests are of assistance in grading severity of dry eye and recommending treatment options, as well as monitoring the effect of some treatments. Some of the recommendations for such testing may depend upon availability of the in-office tests and whether the symptoms or signs of dry eye have changed in particular patients. The provider may advise additional testing or a change in therapy, but not all patients will require such testing or altered treatment. The treatment options recommended by a patient’s care provider will depend upon the severity of dry eye disease and the response to previous therapy as well as any existing contraindications to particular treatment options. It also is important to remember that these are recommended guidelines and not mandatory standards of care for all patients with dry eye. The clinical evaluation and overall assessment of each individual patient determines appropriate management as well as the cost/benefit balance for any given patient. This information was first printed in The Moisture Seeker, SSF's member newsletter. July is Dry Eye Awareness Month! During July, the Sjögren’s Syndrome Foundation works to help educate the public about dry eye symptoms, treatment options, and the possible cause being Sjögren’s. We hope you enjoy our July blogs aimed to promote dry eye education and encourage you to share this post. 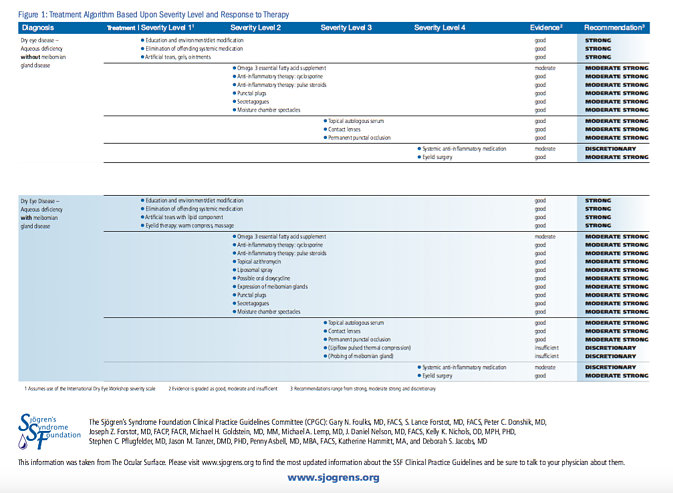 The Sjögren’s Syndrome Foundation (SSF) has developed the first-ever U.S. Clinical Practice Guidelines for Ocular Management in Sjögren’s to ensure quality and consistency of care for the assessment and management of patients. The SSF Clinical Practice Guidelines for Ocular Management in Sjögren’s established that, in a given patient, the clinician must determine whether the dry eye is due to inadequate production of tears, excess evaporation, or a combination of both mechanisms. The success of a treatment option depends upon proper recognition and approach to therapy. Click here to view the SSF Clinical Practice Guidelines for Ocular Management in Sjögren’s and its recommendations. The SSF Sjögren’s Clinical Practice Guidelines initiative is funded fully by the SSF with no corporate or pharmaceutical industry support. The SSF would like to thank our committee chairmen and members of the ocular working group for volunteering their time and expertise to develop these guidelines. We would also like to thank all SSF members and our generous supporters for helping to make the dream of Sjögren’s Clinical Practice Guidelines start to become a reality!